These are the headphones that ears dream of. Looking for more affordable headphones with a mic built-in? Check out our guide to the best gaming headsets. After months of testing and retesting more than 30 popular headphones including over-ear open and closed models, affordable headphones and high-end audiophile headphones, I've come up with the best headphones that deliver exceptional audio performance for gaming, music, and movies. Contrary to popular belief, a good pair of headphones for music is also a good pair of headphones for gaming. At their bare basics, a gaming headset and headphones are simply two drivers mounted on a head piece. The drivers are full-range and either do a good job of reproducing the entire frequency range, or a poor one. A pair of headphones that don't perform well in general isn't going to perform well in games either. Within the headphone category you can either go open-back or closed-back. Both come with their own advantages and caveats. If you want an open and spacious sound-stage, you'll want open cans. The only problem is you'll have to deal with sound leak. This means that anyone within your vicinity will be able to hear what you're listening to. Closed headphones don't have a sound leak issue, but also don't provide the same spacious sound-stage and in some cases make the audio sound slightly compressed. There are clear camps pitched on both sides of open and closed designs, but in the end, it depends on what you want, and what environment you'll be in most of the time. The following headphones are the high-end cream of the crop, ranging in price from $300 to more than $4000, tested on a $50,000 head and torso simulator. Whether you go open-back or closed-back, your ears will thank you. If you're looking for gaming headsets specifically, check out our top picks here. After months of testing various headphones in all price ranges, the Ether from MrSpeakers is the best overall high-end headphone. The Ether has all the right ingredients: sound quality, comfort, construction and materials, and utility. The Ether employs a relatively new form of driver technology called planar-magnetics. Although the technology has been around for several years, it's only now attracting mainstream attention. Unlike dynamic driver headphones which use a membrane moved by a voice coil, planar magnetic drivers sandwich the membrane between two magnets. The membrane itself is laced with thin traces and moves as a whole, without a coil. In theory, this allows the driver to move almost uniformly evenly across its surface, producing better sound. The Ether demonstrates the advantages of planar magnetic technology extremely well. Audio is crisp, clean, and authoritative throughout the entire frequency spectrum. Low frequencies dipped down into my bowels and highs were crisp without ever being shrill. When professionally measured, the Ether demonstrated its capabilities clearly. Ether's excellent flat response across the whole spectrum. Distortion remained under 1% THD even at high volumes. Balance tolerance between L and R drivers is excellent. Measured frequency response for the Ether puts most headphones to shame. The Ether puts out a very flat curve, throughout the entire spectrum, which is what you want so that all frequencies sound balanced. Distortion is also a non-issue, even at high volumes. We measured all the headphones at loud 94 dBSPL, pushing them quite hard. But even at ear-damaging volumes, the Ether remained composed and virtually distortion free. Because of its open-back design, the Ethers do extremely well in conveying a wide soundstage. In games, its performance was exceptional, and delivered the impression of hearing the environment in the game more convincingly than any closed-back headphone and even most open-back headphones. The only drawback of open-back cans is that they can be a disturbance to those around you. For the more discrete user, MrSpeakers offers the Ether C, which is a closed-back version of the Ether. Its performance is essentially the same as the Ether, but it doesn't quite have the same wide and open sound signature. 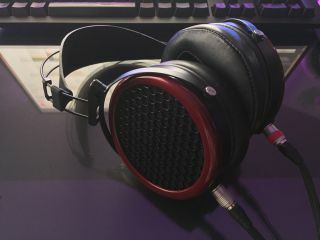 After weeks and months of listening to numerous high-end headphones across the full price spectrum, the Ether from MrSpeakers was the overall best. In terms of comfort, the Ethers are extremely light weight and fit nicely on both large and small heads. The headband on the Ethers are made from a nickel-titanium alloy dubbed NiTinol. It bends and flexes easily in any direction but always returns to its original shape. We had several people try on the Ethers and all said it was one of the most comfortable headphones they had ever tried. During use, the Ethers comfortably sat on my head for hours without ever feeling heavy or tight. Customers can customize the Ether with either angled or flat ear pads. The sound-stage does change slightly between the two pad styles, with the angled pads sounding slightly wider. The Ether ships with its own hard case for travel and the company supplies a variety of cables, which are fully detachable via custom locking connectors. As of this writing, MrSpeakers has updated all of its Ether and Ether C headphones to version 1.1 and no longer ship the original versions. The 1.1 headphones have slightly modified inner ear pads that cover the drivers. The result is an even flatter frequency response and better low frequency extension. 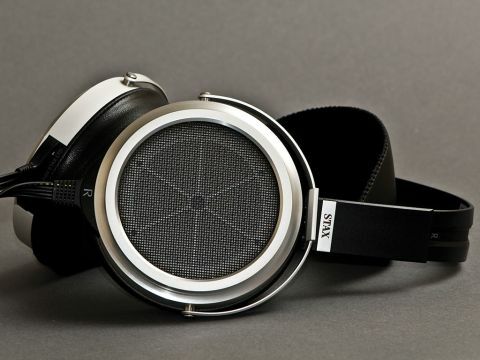 If you already have 1.0 versions, MrSpeakers will sell you the 1.1 upgrade kit for $10. The LCD-2 from Audeze is a spectacular headphone that delivers all the goodies of a planar-magnetic headphone for a reasonable price. Its audio quality is excellent and resolution exceptional. It's not quite as flat as the Ether C, but it comes close. And while it's made well with luxury accents such as Shedua wood, it's a bit on the heavy side and becomes uncomfortable to wear after two hours. The EL-8 OE sits at $700 and delivers excellent sound. My impression is that the EL-8 produces a "darker" sound signature than others. Some may perceive this as a pleasing "warm" tone. It's a planar-magnetic offering from Audeze but doesn't look like any other planar on the market. I actually think it's actually the best looking planar. The EL-8 OE delivers the sound of a $1500 pair of headphones at half the price and will look good on you out in public. My only complaint is with the aluminum support for the head band: it make a creaking sound when moved, which can sometimes happen if you're walking about. The membranes also exhibit a crumpling sound when the headphones move sometimes, which may or may not be noticeable to you. Audeze tells me this is common in planar-magnetic headphones that have thin membranes, but I didn't notice that in any of the other planars, including Audeze's own LCD-2, 3 and 4. The best part of the EL-8 though, is that it can be easily powered by any modern smartphone. Very flat most of the way with a curious notch in the highs. 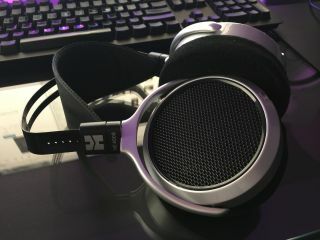 The PM-1 is one of my favorite headphones. It's extremely well made and the company's other headphones (PM-2 and PM-3) are well liked by customers on Amazon. The PM-1 sounds better than essentially all other dynamic-driver headphones you can buy, and is well packaged. It isn't as heavy as the Audeze LCD-2 but still gets uncomfortable after a while. I would describe the sound signature of the PM-1 as silky smooth. The PM-1's response is very good and balanced. The Fostex TH-900 is a traditional dynamic-driver headphone and is one of the best on the market today. The bass response is excellent and the mids are well presented. The only issue I had with the TH-900 is its highs are quite piercing to me. Some folks may find that the TH-900 is a very "detailed" headphone and may prefer its upper-end response. For me, it was a tad too uncomfortable. As a closed-back headphone, you won't have any sound-leak issue and it's one of the most beautiful headphones ever made. TH-900's curve rises toward the end, producing a very sharp signature. The T1 is Beyerdynamic's flagship headphone that's not fully open and not fully closed. The T1 tries to obtain a balance between the wide sound stage of an open-back design while being a bit more discrete. It does a fine job of reaching that middle ground but I'd wager that it still performs more like a pair of open cans, which is to say that it's excellent. Like the Fostex TH-900, the T1 is a dynamic headphone, but while their exteriors may look similar, the T1 has angled drivers while the TH-900 drivers face directly at your ears. I found the T1's sound signature to be more pleasing than the TH-900. The T1 is one of the best sounding dynamic headphones around. The HD 800, and the new HD 800 S, have been Sennheiser's statement headphones for years, and rightly so. The HD 800 is considered by many to be the best headphone on the market. But I disagree. It was the best. But given all the new players on the market, and other technologies such as planar-magnetics and electrostats, the HD 800 is now one of the best, but it isn't the best. But it's still an exceptional pair of headphones. The HD800s is a fully open-back pair of headphones known for excellent imaging and sound-stage as well as its ability to finely resolve detail. Some have considered it to be a bit too sharp for long-listening sessions, but others enjoy its shine. While I praise the HD 800 for its superb audio quality, I found it to be not quite comfortable. Its large ear cups are hard and don't fully enclose around my head. If only it had more plush pads. The HD800's legendary response curve: detailed but sharp. 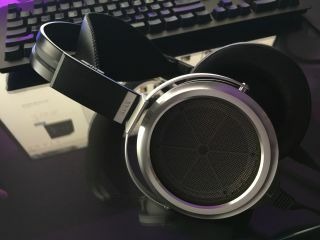 The HiFiMAN HE400S is not only raved about by reviewers and customers—I also thought its performance was incredible for the price. At slightly under $300, you're essentially getting the audio quality of an $800+ pair of headphones. In fact, even some headphones that cost well above $1000 don't sound quite as good or measure as well as the HE400S. HE400S measures well, listens even better. Low distortion across the board. Amazing left and right driver balance. The HE400S, like the Mr. Speakers Ether, is a planar-magnetic headphone. This essentially means it's going to measure well right off the bat, as all planar headphones tend to sound phenomenal by nature. The primary differences in sound signature between different planar headphones are going to come down to enclosure design and tuning. The entire frequency range is superbly represented by the HE400S. Vocals are clear, mids are balanced, and bass notes are shockingly good. Both games and music sound great on the HE400S due to its open-back design. Some might scoff at this, but the sound field is lively, and makes a huge impact in games. On some headphones, being open-back can have an adverse affect on bass response, but not so with the HE400S. Don't get me wrong: the HE400S isn't littered with bass to the point where other frequencies are overpowered. Its control of bass is essentially unheard of within its price class. Delivering performance that's usually reserved for headphones costing many times as much at a sub $300 price point is going to have some tradeoffs. Thankfully, HiFiMAN made sacrifices in areas that have no baring on audio performance. The downside though is you can visually see some of those tradeoffs. The silver finish, for example, can rub off at the joints. The plastic material also feels a tad cheap, although could probably be remedied if HiFiMAN didn't use a glossy finish. I didn't experience any structural issues during testing but I did pass on my findings to HiFiMAN and the company said it would look into the scuffing problem. I would say that the HE400S is worth every dollar over the popular Sennheiser HD 598 headphones. Extremely popular with users, the HD 598 is a good headphone no doubt, but it doesn't even come close to the performance of the HE400S. Yes, the HE400S is double the price of the HD 598, but will literally dance toe-to-toe with Sennheiser's flagships—save for the new Orpheus. No other headphone comes close in terms of performance-per-dollar. The HD 600 is the step up above the popular HD 598. It has a more flat frequency response and overall better sound-stage than the HD 598. The drivers in the HD 600 require a bit more juice, but if you have a competent DAC or headphone amp, it shouldn't be a problem. Often used by studios to mix, the HD 600 has a very balanced sound signature and thanks to its open design, delivers good imaging. Well balanced throughout. Could use slightly more low-end. If you're looking for the absolute best headphone on the market, my pick goes to STAX for its SR-009. Essentially, you're not going to find a better audio experience elsewhere. The only caveat is whether or not you're willing to shell out the money for a pair and an accompanying amp to power these electrostatic ear muffs of audio ecstasy. Exceptionally flat response and control. Very good THD. 2 spikes in the low end are good for bass, not bad. Good driver balance, as expected from a flagship. What is an electrostatic headphone? In a nutshell, headphones of this kind use a membrane that moves itself via current applied directly to it while being wedged between two charged plates. Aside from STAX, Sennheiser is also famous for its original (and now new) Orpheus headphones, which also use an electrostatic design. STAX, however, only produces electrostatic headphones and are famous for doing so. The SR-009 is the company's flagship headphone, and it packs a wallop in terms of audio quality. Everything, and I mean everything, sounds good on the SR-009s. Music is incredibly balanced and showcases the precise control that the electrostatic drivers exert over air movement. Bass notes extend down to truly subterranean levels while highs are impressively detailed. These headphones are made for those who demand to hear every nuance of what's happening. The SR-009 is all about resolution. Let's be honest though, no one's going to buy a SR-009 just for gaming, but I decided to try them out in games anyway. Performance in games is equally stunning. Explosions, gun shots, and any other type of sound effect is rendered with more realism than I could have thought possible. I know this is starting to sound like hyperbole but I really don't have the lexicon to adequately convey how good the SR-009's sound. Notice the custom electrostatic connector. Custom amp required. STAX didn't cut any corners with the SR-009 anywhere. The build quality of the SR-009 is like a well-built truck with the svelte body of a sports car. The entire headphone is made out of aluminum and other metals, save for the leather band that rests on your head. Even with close inspection, you can tell STAX engineers paid attention to detail and went to great lengths to make sure you feel the SR-009 oozes quality as soon as you hold them. So what's the catch? By the time you get everything set up to enjoy a pair of SR-009, you'll probably be approaching $7000 if not more. The headphones themselves cost about $3800 and electrostatic amps can climb in price quickly. The LCD-4 represents Audeze's flagship planar-magnetic offering, and the company has thrown in every feature it has. High-end wood finishes, real carbon-fiber headband, and a new planar system Audeze calls Double-Fluxor Magnet Arrays, which is essentially a system of more powerful magnets arranged in a proprietary manner to produce tighter control over the moving membrane. The LCD-4's membrane is also made ultra-thin, to reduce mass. The resulting performance is nothing short of stellar, and the LCD-4 performs beautifully in both listening and measurements. If you're seeking an end-game headphone that doesn't require special electrostatic amps, then the Audeze LCD-4 would be my pick. $4000 for one. You'll still need a good amp though. A response curve most headphones can only dream of. There's no question about it, all of the recommended high-end headphones are pricey, save for one or two options. However, in the given price ranges, you're not going to go wrong with any choice. All of the above headphones will leave any "gaming headset" literally in the dust in terms of audio performance in both games and music. If you plan on using a pair of headphones for gaming duties and need a microphone, there are two ways: pick up a high-quality standalone microphone that you can either let stand freely on your desk or mount on an arm, or, grab a Modmic by Antlion Audio. The Modmic is a route that's popular with many gamers who choose to use headphones rather than gaming headsets. Setup is easy, and the quality of the mic input is excellent. In our experience, the uni-directional Modmic is better than the omni-directional version only because it doesn't pick up clicks and clacks of the keyboard.